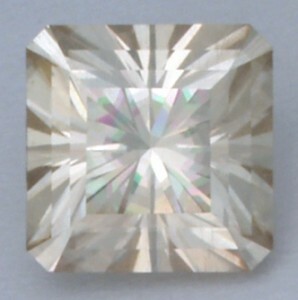 A quick and easy Fast Barion Square with the same number of facets as the Standard Round Brilliant. 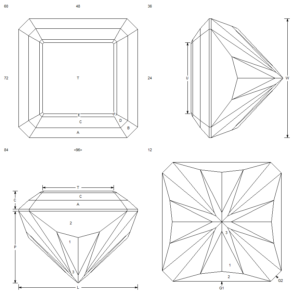 This design works best in higher-RI materials like Sapphire, Demantoid Garnet and Moissanite. Provides good scintillation and dispersion. Hi John looks like a nice design, i have cut the checker board design and it looks great. Thanks, Dom, for sharing that. Beautiful Smoky! Glad you’re enjoying the designs. Please stay in touch! The crown of this will tend to darken, the pavilion is brilliant, but deeper, so it’ll look good in most anything. Hope you have a good time with it – fast and easy to cut! Thanks again, Wayne. Hope you enjoy cutting them! I really like this design and I followed along in GemCad. A really nice neat quick design that I will have to try once I get the proper rough. When I see a really nice design that I like but don’t have the correct RI rough to use I sometimes will cut it in lower RI material anyway. I have heard that tangenting a design down to a lower RI does not work very good. Is this true in your experience. Thanks for the nice comments. Glad to know the vid is useful to you. Not all designs will function in all RI materials, even if you T/R them to higher angles. The thing to do is to get competent with GemCAD and then do the changes and ray-trace extensively before committing rough and time. Just found and watched the Fast Barion Square video. What a beautiful stone. Will get the pattern out and work on it. It does look easy and simple to follow the instructions.